Pace Sr. Kid’s Church bases their themes around the seasons. Baseball season is no exception. To go along with the song the group would sing to, the leadership asked if I could create a video with lyrics and animation for the kids to follow along to. The goal was to keep the kids engaged, participating and singing along, and to eliminate boredom and distraction. Result? It was a win for the home team! X-Treme Kid’s Kamp at Pace Assembly is quite a production. This year’s theme was to be a video-game style setting, with the department’s mascot Goober, transformed into the game’s avatar. 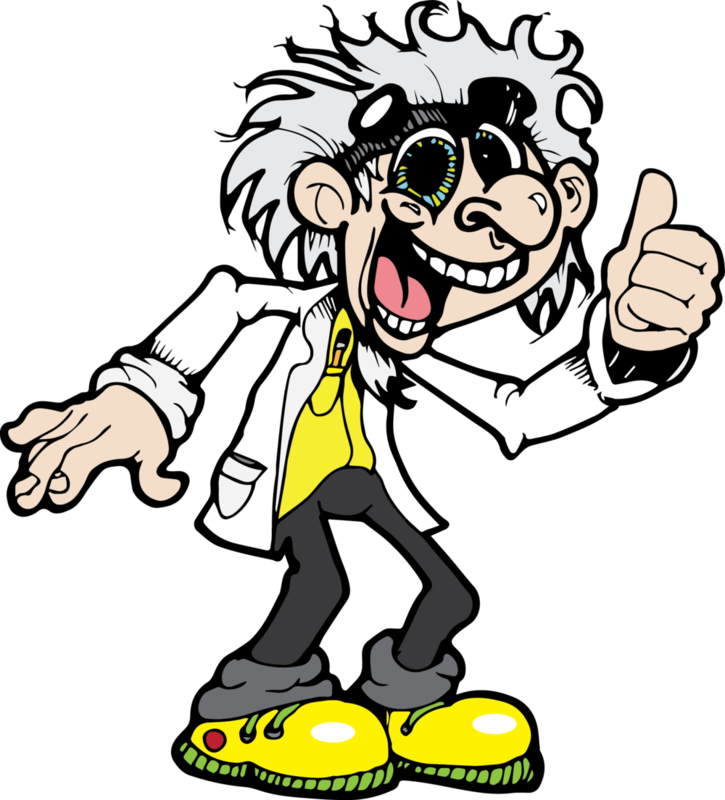 An outside illustrator was hired to create a concept drawing of Goober for their Science-themed event the previous year. My job was to take the concept drawing from the previous year, transform Goober from Scientist to Mario-style avatar and the video game environment using digital illustration. Along with that, I was asked to create the Event Flyer, the Floor Display Banner, the Stage Backdrop, and the Facebook banner. This year’s camp marketing campaign drew in more kids than any previous year. This is the original drawing taken from the illustrator’s paper. The concept drawing would provide the base for my digital illustration. I first imported the drawing into Illustrator and gave him some color. Leaving the hands and face mostly the same. I removed the lab coat and gave the legs a bit of video game movement. Thanks Mario! 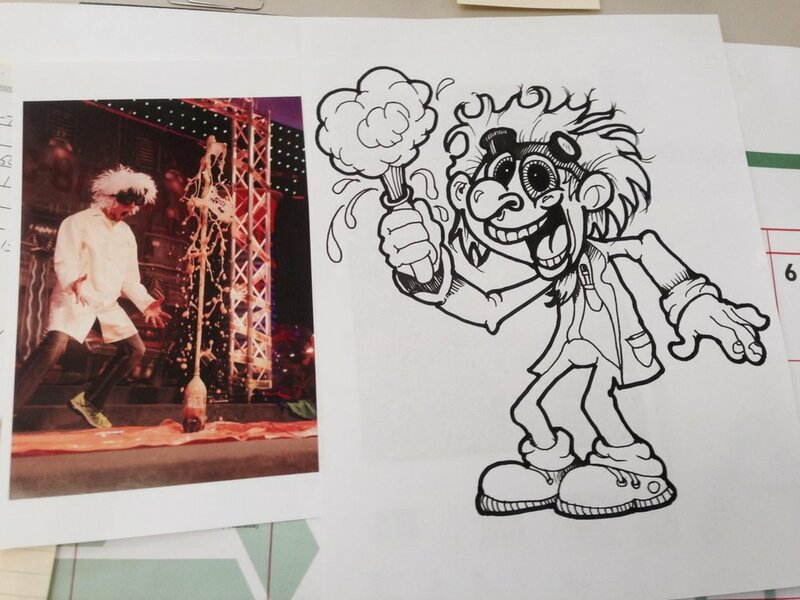 The next phase was to create the stage background. I would use this background for all the project pieces, merging, enhancing, zooming and taking pieces for each scene. I manually recreated the characters in the Mario series one-by-one, along with the foreground set pieces using Illustrator. I moved them into Photoshop and used a few different effects to achieve the pixelated look. Once I had the background in place, I could use different aspects of it on the other pieces, such as the flyer. On the front of the flyer I added the text, using three different game-style fonts, giving the viewer vital information on the camp and what it would entail. 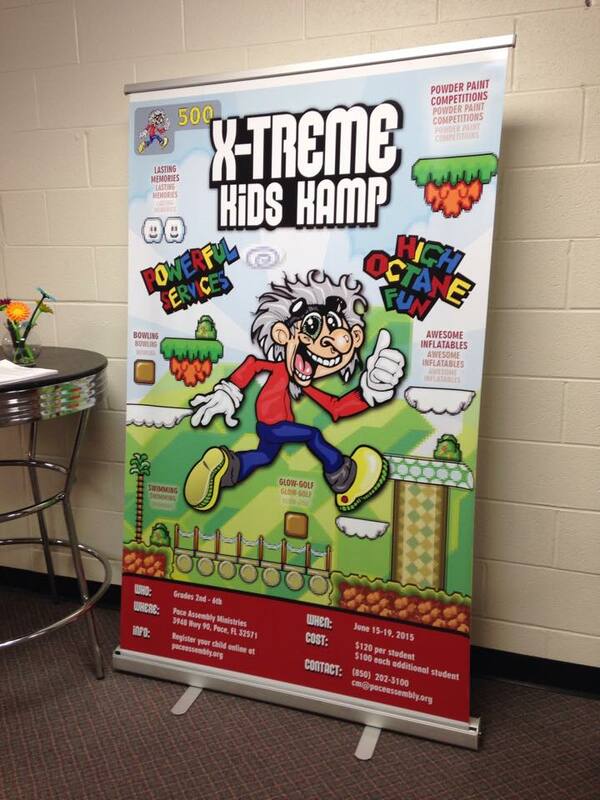 The display banner utilized the flyer’s front design. Strategically placed in the children’s foyer of the church, the banner greeted the kids with their parents as they walked from the sanctuary to the kid’s church area. The eye-catching display made kids’ camp the desired event of the summer. 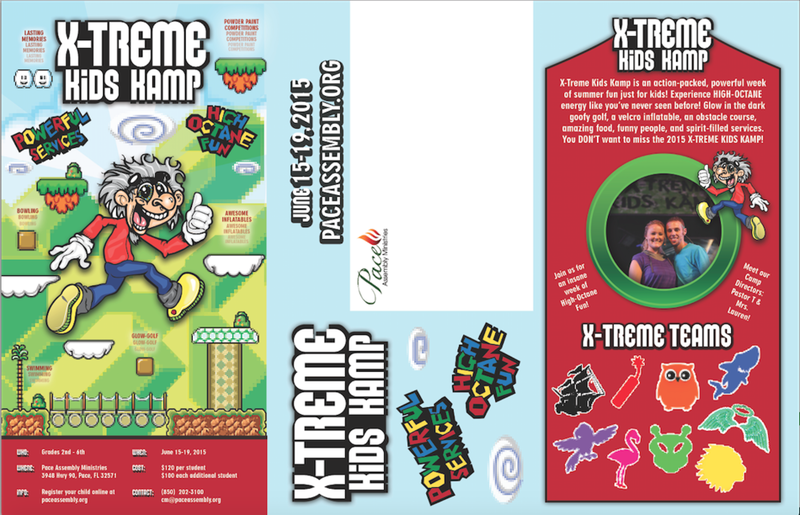 The backside of the flyer became the information mailer for the kids’ camp. Using InDesign I pulled each portion in together. The folded design shows Goober on the front, with the recipient’s address on the back, opening to Pastor T’s and Lauren’s (children’s ministry leaders) welcoming message. The first banner occupied the entire FB banner display space. The second banner allowed room on each side for the profile image on the left and title message on the right..